KILDEER, Ill. -- On a blazing hot day in a Chicago suburb with a heat index of 108 degrees by 1 p.m., all Angel Yin wanted at the end of her round was some shade and ice cream. She got both after she rolled in a 15-foot birdie putt on the 18th hole of Kemper Lakes Golf Club to card a third-round score of 4-under 68. That late charge allowed Yin to move into fourth place at 6-under 210 -- 5 shots behind leader So Yeon Ryu at 11-under 205 -- heading into Sunday's final round of the KPMG Women's PGA Championship. 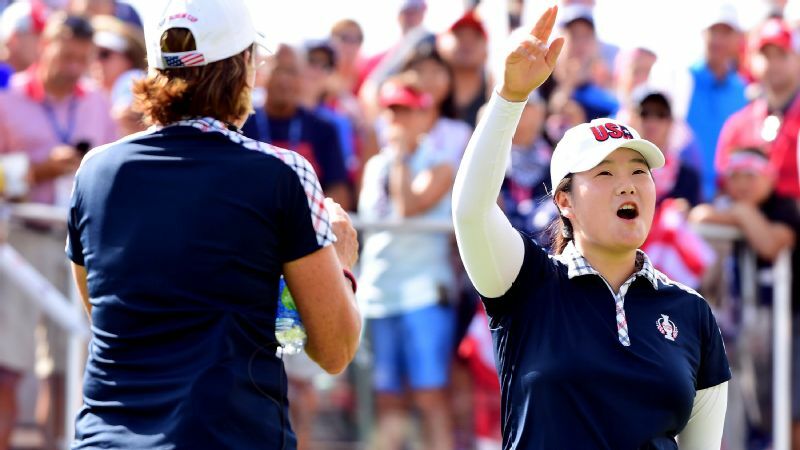 And while Ryu's leading margin on a difficult layout might seem insurmountable to some, Yin, an eternal go-with-the-flow California girl who also happens to average 272 yards off the tee, moved one round closer to winning her first LPGA title. "I don't remember most of it," the 19-year-old said after her round Saturday afternoon. "I feel sick right now because of the heat, but overall, I made some good putts." 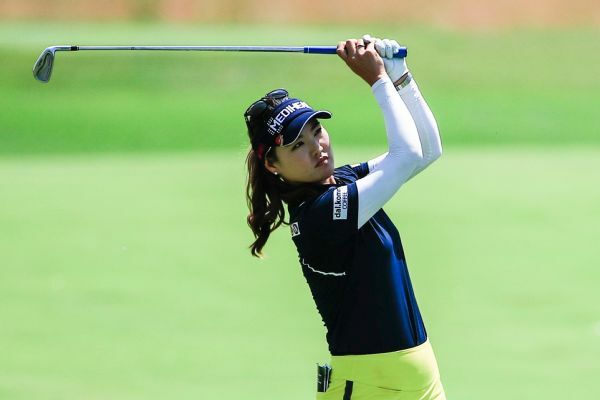 So Yeon Ryu, seeking her third LPGA major, has a 3-shot lead over Brooke Henderson heading into the final round. And when asked about the effects of the heat during the round, Yin, 19, pointed at her pale legs and said, "I don't need to say much. You can just look. I'm wearing a skort. I don't do that. So [my] legs are out and it's hot." 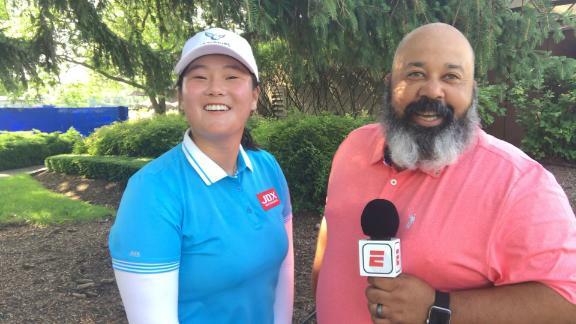 But the affable, second-year LPGA player from Arcadia, California, who normally wears long pants when she plays, was fine to chat once someone handed her a strawberry shortcake popsicle, which dripped on the ground between her answers to media. And she also was fine talking about the maturation of her game that resulted in five top-10 LPGA finishes last year, a captain's pick onto the winning 2017 U.S. Solheim Cup team, and her first professional win at the Ladies European Tour's 2017 Omega Dubai Ladies Classic. "I had been playing well and it just happened," Yin said of her first professional victory last year. "You can be ready to win, but it doesn't always come to you. That time, everything came together and I was fortunate to hold off I.K. Kim and Celine Herbin in the playoff." Yin's hit-it-and-go-find-it style of play works for her and has allowed her to excel on difficult courses under pressure. She nearly won the 2015 U.S. Girls' Junior Championship as a 16-year-old, finishing as runner-up. And as an LPGA rookie in 2017, she twice finished tied for fifth -- coming within sniffing distance of victory -- and finished second in the LPGA's 2017 rookie race. The 5-foot-9, baby-faced bomber apologizes that she's "not very good" at analyzing her rounds or describing where she thinks she is in her on-course performance right now, but she allows that her "game has matured a lot." 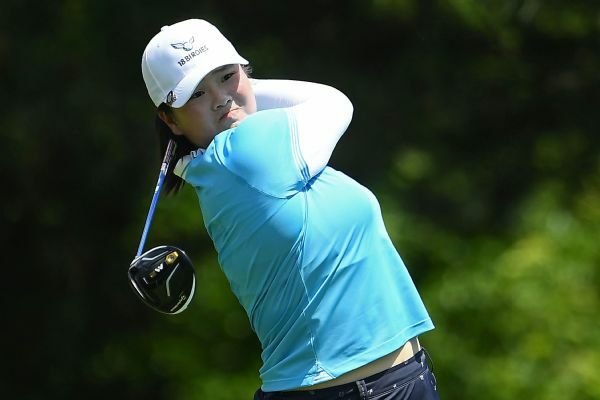 Of her approach to the final round, American teen Angel Yin said, "Nothing changes ... I'll wake up, eat, go out on the range, hit some balls and if I play well enough, I'm holding that trophy." "I've learned a lot of my weaknesses in golf, like distance control, so I've been working on that," she said. "And I know my strengths -- my distance, my short game." But when asked how she prepared for the 2018 season, Yin just smiled as she held the dripping frozen treat away from her seldom-worn skort -- one of six she said she owns "just in case it's really hot." "I didn't really touch a golf club in the offseason -- well, maybe two weeks before we played in Australia," she said. "But I've been working on things that I wasn't good at -- like distances around 120 yards and in, and ball control -- and now it shows when I play challenging golf courses like this." In Saturday's third round, Yin rolled in consecutive birdies on holes Nos. 3 and 4, took a bogey on No. 5, and then countered with another birdie on the eighth hole. When she made the turn, she drained another birdie putt from 9 feet on No. 10 and made consecutive birdies from within 30 feet on Nos. 11 and 12. "I got the feel," she said. "I felt it on the greens. I don't ask questions. I just take it and I go." Kemper Lakes' challenging three finishing holes, called "The Gauntlet," forced the playful teen to buckle down to avoid a moving-day disaster. Yin took an untimely double-bogey on the par-four 16th. 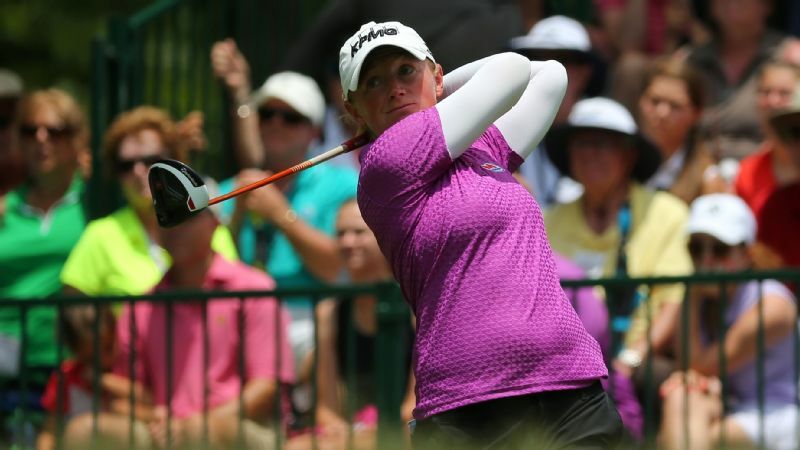 Her tee shot found a fairway bunker and she then misjudged an 8-iron approach shot that sailed into the water hazard. Yin hit her next shot close, but missed the downhill, 6-foot putt for bogey. She steadied herself for a solid par on No. 17, and then hit her approach to around 15 feet on the final hole to set up her last birdie putt of the day. "When I was hitting my second shot, I was thinking, 'If I make it [from the fairway], I can just leave and go to the scoring tent,'" Yin said. "I just want to get out of here [because] it's hot today. "But that birdie was good. I ended my day well." With inclement weather in the forecast Sunday afternoon for the final round, players will tee off early, starting at 7:19 a.m., in groups of three from both the first and 10th tees. 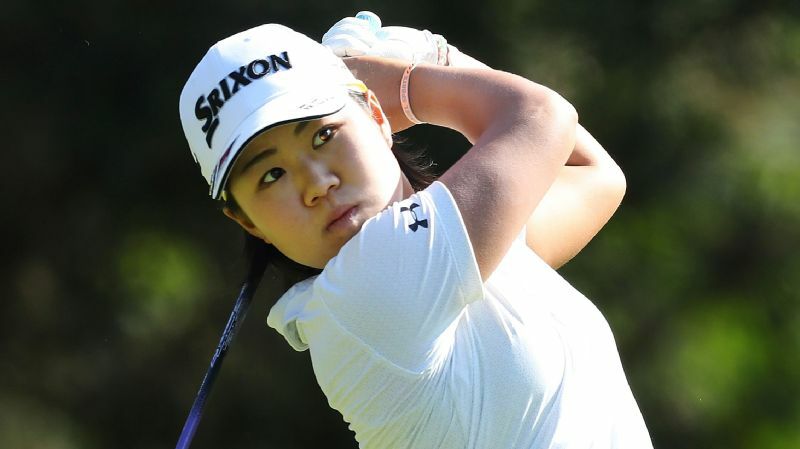 Playing one group behind leader Ryu in a pairing with Brooke Henderson (8 under) and Sung Hyun Park (7 under) on Sunday, Yin likes her position with 18 holes to play. She plans to "stay calm, stay cool" and, in true California fashion, "just try to ride the moment." 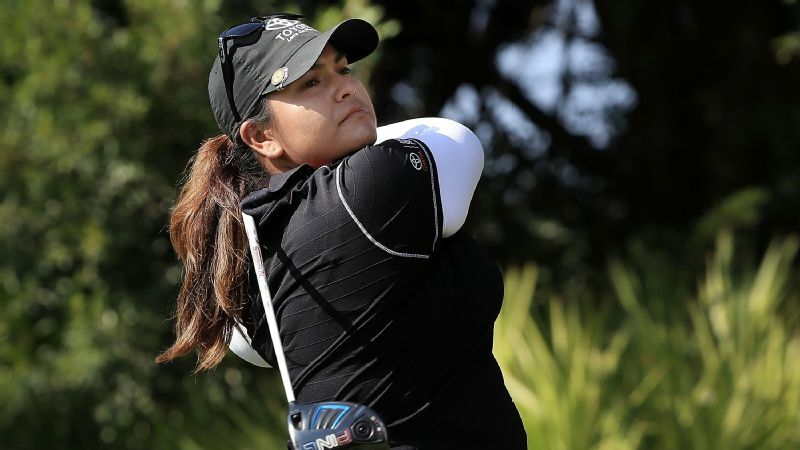 Yin knows her length off the tee gives her an edge on the challenging Kemper Lakes course, just as it did at Lake Merced in Northern California earlier this year, where she tied for third at the LPGA Mediheal Championship. "When you hit it as long as I do, even if you miss it just by a touch, it's manageable because you're still going to have a wedge into the green," Yin said. And even with Ryu's 5-shot cushion, Yin is eager to chase the leader. "I like where I am right now," she said. "Nothing changes tomorrow. I'll wake up, eat, go out on the range, hit some balls and if I play well enough, I'm holding that trophy." Only this time, she hopes to be posing as a winner in her hot-summer-day skort.